The Princeton Review and Entrepreneur Magazine have named the University of Maryland as one of the nation's top schools for entrepreneurially-minded students. Their latest ranking of campus entrepreneurship programs puts Maryland at No. 18 (No. 9 among public) for undergraduate and No. 22 (No. 12 among public) for graduate entrepreneurship programs. The rankings were released in the October issue of Entrepreneur magazine. Entrepreneurship education initiatives offered by the Maryland Technology Enterprise Institute (Mtech), a unit of the A. James Clark School of Engineering, played a key role in the new ratings. Mtech's programs feature 25 for-credit entrepreneurship courses enrolling over 1,000 students annually, two living-learning programs, one community college transfer program, seed funding, and mentoring. Mtech's overall programs add to these offerings with a business plan competition, product development funding, free intellectual property services, entrepreneur office hours, a venture accelerator, prototype lab, incubator, and additional support for companies throughout their lifecycles. Minor in Technology Entrepreneurship: This new, 15-credit undergraduate minor prepares students for launching successful technology ventures and bringing life-changing products and services to market. The minor develops the entrepreneurial mind-set and functional skillsets of students to improve their ability to create, launch, and manage technology ventures. Hinman CEOs Program: As the nation's first living-learning entrepreneurship program, Hinman CEOs is a groundbreaking initiative placing entrepreneurially-minded students from all technical and non-technical academic disciplines in a unique community. Students live together, learn about entrepreneurship, and can launch new ventures. Hinman CEOs companies have generated more than $35 million in revenue since 2000. Two Inc. 500 (Squarespace and Lurn) companies have emerged from the program, launched in 2001. Hillman Entrepreneurs Program: Hillman Entrepreneurs is a scholarship program for students beginning their study at Prince George's Community College who have an interest in entrepreneurship and an enthusiasm for starting a business venture or leading a company. The program includes entrepreneurship and leadership courses, intense mentoring, networking opportunities, and community building. Entrepreneurship and Innovation Program (EIP): EIP provides University of Maryland Honors College freshmen and sophomores with an interdisciplinary, living and learning education to help build the entrepreneurial mindsets that includes experiential learning, challenging academics, a living community, coaching and mentoring, and access to funding. University of Maryland $75K Business Plan Competition: This annual technology business plan competition features investor pitches to venture capitalists and entrepreneurs and $75,000 in prize money. Winners include five multi-million dollar ventures and two Inc. 500 companies. For a list of Mtech's entrepreneurship education initiatives, visit: http://www.mtech.umd.edu/educate/index.html. For access to information about all of Mtech's entrepreneurship and innovation programs, visit: http://www.mtech.umd.edu. 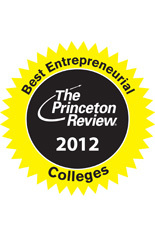 The Princeton Review surveyed 2,000 schools for the rankings, which are based on key criteria in the areas of teaching entrepreneurship business fundamentals in the classroom, staffing departments with successful entrepreneurs, excellence in mentorship, providing experiential or entrepreneurial opportunities outside of the classroom, as well as non-traditional, distinguishable aspects of their programs. The University of Maryland rankings are attributed to strong programs at both the Smith School and the A. James Clark School of Engineering and fruitful collaborations between the schools. The University of Maryland's rankings can be seen at www.entrepreneur.com/topcolleges and www.princetonreview.com/entrepreneur.